HIAWASSEE, Ga. – Memorial Day is a time to honor military service members who paid the ultimate price for American freedom, and Towns County officials and citizens gathered at the Civic Center beside the county courthouse to pay due respect. Originally scheduled to take place at Veterans’ Park on Highway 76 east, the ceremony was relocated to the indoor venue the day prior, due to the threat of unfavorable weather. The facility was filled to near-capacity with many wearing shades of red, white, and blue, and others donning scarlet poppy flowers in remembrance of the fallen. Towns County Commissioner Cliff Bradshaw, Towns County Fire Chief Harold Copeland, Hiawasssee Mayor Liz Ordiales, and Hiawassee Police Chief Paul Smith attended the solemn ceremony. The call to order was delivered by Veterans of Foreign Wars (VFW) Commander Bart Rodgers, followed by the posting of colors, and Pledge of Allegence led by the North Georgia Honor Guard. A prayer invocation, and dismissal blessing was offered by Dwight Moss. Pam Leslie and choir sang the National Anthem, encouraging the public to add their voices to the song, and the group concluded the program with a rendition of a patriotic hymn. 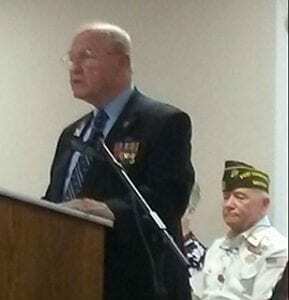 The keynote speaker was retired U.S. Army Captain Alfred Lipphardt, a decorated Vietnam veteran who served as a platoon leader. Lipphardt was inducted into Officer Candidate Hall of Fame this year at the National Infantry Museum at Fort Benning, Georgia. Lipphardt has been a member of the VFW since 2002, and the comrade is a candidate for the high office of VFW Commander-in-Chief. Retired U.S. Army Captain Albert Lipphardt served as the keynote speaker at Monday’s ceremony. The laying of wreaths were presented by individuals representing VFW Post 7807, American Legion Post 23, Marine Corps League-Unicoi Detachment 783, Army-Navy Squadron 66, and Sons of the American Legion Squadron 23. North Georgia Honor Guard marched outside of the center for a gun salute, prior to retiring the Colors. 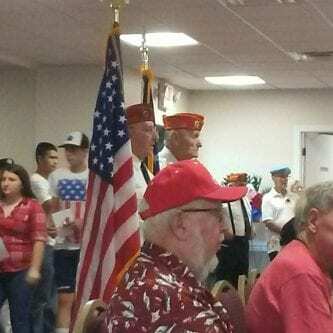 A courtesy lunch at VFW Post 7807 followed the ceremony.